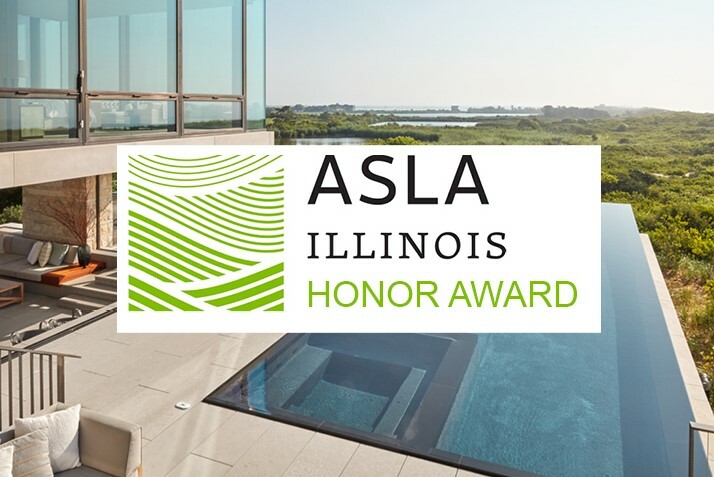 We’re so pleased to announce that the American Society of Landscape Architects (ASLA) chapter in Illinois is presenting Hollander Design with an honor award this spring, the highest award in any given category. The award honors the residential design for Dune House. Our aim at this beautiful oceanfront site was to preserve the sensitive ecologies of native dunes and wetlands by containing nearly all landscape elements within the building’s footprint. The result is an on-structure landscape informed by the spirit, forms, palette and materials of the preserved native landscape beyond. The jury commented on the project’s careful use of local materials and the elegant way it connects the home to its surrounding environment of native dunes and wetlands. We could not be more pleased to have collaborated with Leroy Street Studio and Victoria Hagan Interiors on this project. Our intensive collaboration led to an unusually fluid relationship between art, architecture and landscape. See more about this project on our portfolio page for Fowler’s Beach and on the ASLA website.